Our wedding photography coverage starts at $3500. That includes two photographers, a thumb drive of full resolution toned photos (in both color and black and white! ), and an online gallery. To find our more about what we offer, please visit our investment page. We do! We are based in Columbia, MO, but we have traveled from Colorado to Paris to document weddings, and are always happy to visit new and exciting places. The number of full resolution, individually toned photos that you will receive depends on the number of hours we shoot. Most couples receive between 450 and 600 photos from their day. You will receive every photo in both color and black and white, and our couples own the rights to their images. This means that you can print and share your photos however you wish, without having to pay an additional fee. We are based in the beautiful college town of Columbia, Missouri. After working as newspaper photojournalists from the West Coast to the East Coast, we decided to settle down in the Midwest so our growing family could be closer to grandparents and cousins! We still photograph several weddings a year in New England with our East Coast business Dreamlove Photography, but as our kiddos approach kindergarten age, our goal is to be based year-round in the Midwest. Do you offer two photographers? All of our packages come with two photographers. 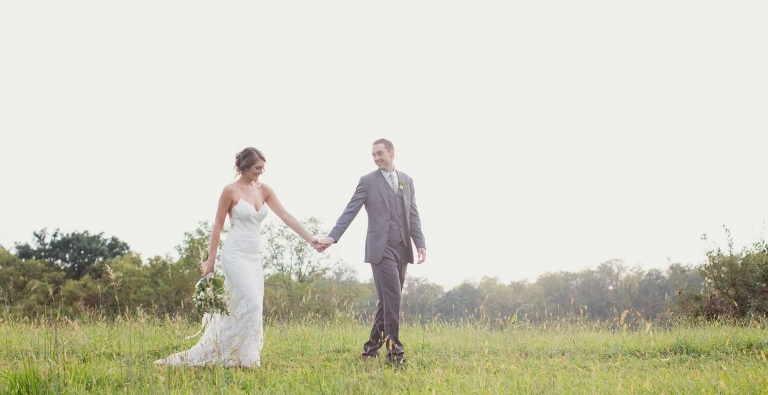 Katie and Max are the lead photographers and owners of Wildflower Wedding Photography. Sometimes, the two photographers for your wedding could be both of us, but usually it is Katie OR Max with one of our talented second photographers. You will know who your lead photographer is immediately, and the second photographer is determined within three months of your wedding date. We are more than happy to furnish full galleries of weddings shot by either Katie or Max with our second photographers. Why don't you photograph weddings together? We started our business in 2009, and photographed all of our weddings together. After several years of 20+ weddings a year, we realized that we were both very strong lead photographers. In 2015 (when we coincidentally had 690 inquiries for the year), we made the business decision to take on weddings individually and work with second photographers when needed. This was a bit sad, because Max and I absolutely love to work together, but we have built a network of AHMAZING second photographers in the area to work with. We are always happy to share full galleries of our work with various second photographers, just ask! We love engagement sessions! We offer a few options for these kinds of sessions. A mini engagement session lasts 30 minutes and is $250, while a full session lasts up to 90 minutes and is $650. Our mini sessions include one outfit and you receive roughly 15 full resolution images from the session. Our full engagement sessions allow for two to three outfit choices, a variety of backdrops and you receive 40-50 full resolution images after the session. All of our engagement sessions are conducted outdoors using natural light with a candid approach. We have a variety of spots around Columbia, MO that we love, but are always happy to spend time with couples in a location that has sentimental value to them. See examples of our engagement sessions here. What about elopement and anniversary sessions? We absolutely LOVE it when couples ask us this question. While we thoroughly enjoy weddings, we definitely are not entrenched in wedding culture. Katie would rather have dirt under her fingernails from gardening than read a Martha Stewart Weddings magazine, and Max can usually be found watching Cardinals baseball in his free time! What we love about wedding photography is the documentary aspect of telling a couple's unique story. We thrive on the challenge of finding new and creative ways to help our couples remember their wedding day. We love the art of clean composition and the emotion of unscripted moments between people. While Katie does have a secret love affair with photographing the little details and decorations of a wedding, that isn't why we tell our friends that we have the best job in the world. We have the best job in the world because we get to spend time with people who are madly in love, and capture moments for them that tell the true story of who they are, and how their wedding day unfolded. We started documenting weddings in 2009, and in 2011, wedding photography become our full time job. We have photographed over 200 weddings (and counting!) throughout the country. We accept roughly 20 weddings per year and we typically book dates 6-18 months in advance. When will we see our pictures? One of the things that sets our wedding photography business apart from others is our turnaround time for your much anticipated photos. All of our photos are edited in our home studio (by us!) and we don’t mess around. Our couples can expect to see 3-5 sneak peek photos via our Facebook Page and Instagram account in the week following the wedding, and a blog post of our favorite 50-75 images within 2-3 weeks. We mail your thumb drive out within 2-4 weeks of the wedding date, so you can relive all of the wonderful moments from your day while that cake in the freezer is still edible! Our wedding photography coverage starts at $3450. That includes two photographers, full day coverage, a thumb drive of full resolution toned photos (in both color and black and white! ), and an online gallery. To find our more about what we offer, please visit our investment page. We’ve found that every wedding is unique and it doesn’t make sense to squeeze all of the moments of the day into a five or seven hour tidy package. Our photography coverage begins with one hour of getting ready photos and ends after we’ve captured the important moments of the reception following dinner. Without a rigid time constraint, we’ve found that our couples are less stressed on the wedding day, which always makes for happier photos! We do! We are based in Columbia, MO, but we have traveled from Colorado to Paris to document weddings, and are always happy to visit new and exciting places! The number of full resolution, individually toned photos that you will receive depends on the number of hours we shoot. Most couples receive between 500 and 600 photos from their day. You will receive every photo in both color and black and white, and our couples own the rights to their images. This means that you can print and share your photos however you wish, without having to pay an additional fee. We love engagement sessions! Our engagement photography sessions are $450, and are conducted outdoors using natural light with a candid approach. We have a variety of spots around Columbia, MO that we love, but are always happy to spend time with couples in a location that has sentimental value to them. Our engagement sessions are very laid back and usually last 60-90 minutes. You are welcome to do an outfit change during the shoot, and we are happy to pass along outfit suggestions that photograph well! Couples will receive a link within two weeks of their engagement session to download roughly 40-50 full resolution, individually toned photos from their session. See examples of our engagement sessions here. Yes, and yes. Our elopement and anniversary packages are very simple. We charge $350/hour of photography, and that includes a download link of roughly 35 full resolution and individually toned images per hour of shooting. We absolutely LOVE it when couples ask us this question. While we thoroughly enjoy weddings, we definitely are not entrenched in wedding culture. Katie would rather have dirt under her fingernails from gardening than read a Martha Stewart Weddings magazine, and Max can usually be found watching Cardinals baseball in his free time! What we love about wedding photography is the documentary aspect of telling a couple’s unique story. We thrive on the challenge of finding new and creative ways to help our couples remember their wedding day. We love the art of clean composition and the emotion of unscripted moments between people. While Katie does have a secret love affair with photographing the little details and decorations of a wedding, that isn’t why we tell our friends that we have the best job in the world. We have the best job in the world because we get to spend time with people who are madly in love, and capture moments for them that tell the true story of who they are, and how their wedding day unfolded. We started documenting weddings in 2009, and in 2011, wedding photography become our full time job. We have photographed 154 weddings (and counting!) throughout the country. We accept roughly 25 weddings per year and we typically book dates 6-18 months in advance.